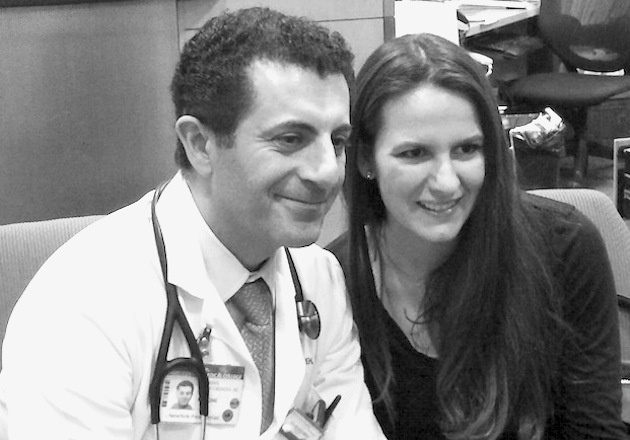 The Resident Tourist: Q & A with Dr. Yaghoobzadeh . . .
By now you already know that I have the most amazing cardiologist. If it weren't for Dr. Y's exceptional care and brilliance, I wouldn't be at the point where I am today, feeling strong and healthy. After the TODAY segment, both Dr. Y and I received a ton of followup - not only about my story and gene mutation, but also about general heart health. Tini: What role does diet play in our overall health? We are always hearing that it's good to eat healthy, but how important is it really? Dr. Y: What we eat over a lifetime is probably the #1 most important thing that we do which affects our health (not withstanding smoking, excessive alcohol and drugs). Many studies show that healthy eating can have very strong and measurable effects on health. These are usually not effects that one sees within a week or even months. The effects take years to take hold and therefore do not fit into our instant gratification model. Healthy eating should be the foundation of any plan toward a healthy life. Tini: There are a number of diets people are talking about right now (Vegan, Paleo, Gluten-free, etc). From a health perspective, what diet should we be following? What foods should we be eating and what should we be avoiding? Why? 1) Move toward whole foods and away from processing. This means less pre-prepared meals, more home cooking, less food out of boxes and cans. Less packaged cereals and more whole grains, nuts and seeds. Lots of greens, vegetables and some fruits. When choosing foods like breads/cereals/pasta/snacks - look at the total carbohydrate to fiber ratio. The lower the number (definitely less than 10:1) the better. a) Plants are higher in fiber and fiber is one of the pillars of good health. b) The saturated fats that come with plant proteins are healthier than the saturated fats that come with animal proteins. c) Reducing exposure to animal proteins reduces exposure to much of the potentially harmful 'processing' involved with getting the animal protein from the farm to your table (hormones, pesticides, antibiotics, chemicals, etc). This processing has been shown to change the actual composition of the animal product. 3) Listen to your body. A small group of patients do dramatically better when they cut out gluten. Others have significant improvements after they cut out dairy. 4) One can be purely vegan and still be eating very unhealthy if they are depending on processed foods with simple carbohydrates and unvaried sources of protein like soy. Variation in diet increases exposure to the 'good' and diversifies exposure to the 'bad'. Tini: Have you had any patients whose health has improved after eating this way? Any one story that stands out in particular? Dr. Y: I have many patients who have changed their eating habits which have led not only to weight loss but to improvements in blood pressure, cholesterol and reduction in markers of inflammation. They have been able to come off medicines or avoid having to take them all together. I had a very interesting interaction with a patient who happens to be a very successful baker. This middle aged man sent me blood work to check - which showed truly dramatic improvements in his cholesterol profile. Over the phone, I assumed that one of his physicians had started him on cholesterol medications but teased him that "Looks like you have become Vegan!" I heard a gasp over the phone and he exclaimed, "How did you know?" After a chuckle, we both were impressed with how powerful the effect of this dietary change had been. The same day I interviewed Dr. Y, THIS article was published in the New York Times. Dr. Y sent it to me as a supplement to his answers, writing "Sugar isn't the only villain. The hazards of meat are understated." Hope you found our first Q&A helpful. Stay tuned for a new health topic next month.